Khyber Pakhtunkhwa Board of Technical Education started working to provide technical education to the students living in Khyber Pakhtunkhwa province. KPKBTE provides education in D.Com, DBA and DAE in different engineering disciplines to the students to get the diploma certificates. The candidates can send their application forms to appear in the annual exams of diploma courses, which KPKBTE starts annual exams process. The candidates can find the KPKBTE date sheet of the annual exams of DAE, D.Com and DBA so that the candidates can appear in the annual exams. For the facilitation of the students to prepare their annual exams, the KPBTE past papers of different subjects are added with this post and the candidates can study all these DBA past papers and prepare their annual exams. They can know that some of the questions are repeatedly asked from the candidates in the KPBTE past papers and they can prepare them well to get marks. The candidates can revise their syllabus and check DAE past papers of all technical education boards from this page. They can also know how to answers some particular question to get excellent marks in the annual exams of KPKBTE in different disciplines. 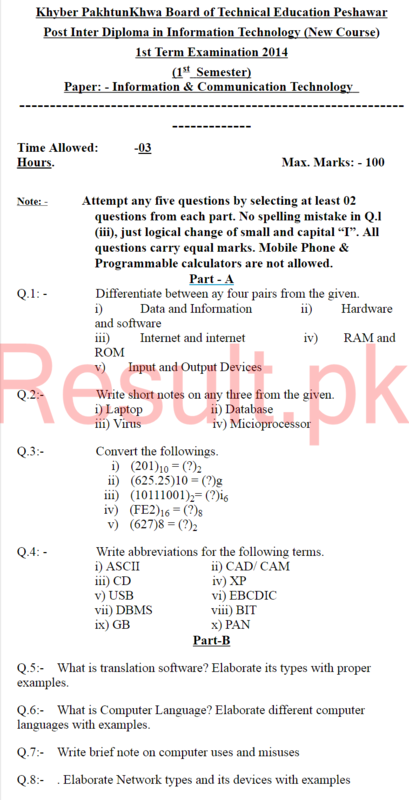 Please send past paper of 3rd year electronics technology KPK Board of Technical Education Peshawar. sir plz give me dit old papers 2015,16,17,18. for 1st semester. sir muje past pepers chahea dit ke 1st semester plz help me . Please sir, send me past papers of DAE civil 3rd year. Please sir, send me past papers of dae civil 2nd year. How I download the previous papers ? Plz sir send me BTE peshawar 2nd year civil 2016 past papers. Plz send me past papers of DIT first term. Plz send me past papers for 3rd year Electrical..
sir i need 1st year mechnical tech. all subjects past papers of kpk techinal board..
Assalam o Alaikum! Please i need all DAE PETROLEUM 2nd and 3rd year papers 2016? If possible please send me on my facebook account inbox me here. For fb : [email protected] thanks brother! Assalam o alikum. i am a teacher of dae private collage.and bachler studen. I NEED ALL PAST PAPERS OF DAE 3RD YEAR SO PLEASE SEND ME AT MY GMAIL ACOOUNT. I need all past paper of 2nd year D.A.E so plz send me. I need past papers of D.A.E mathematics Math 212 Please issue to meee!